Currently in America, large numbers of professionals are interested in networking for a variety of reasons. First, the days of spending all or even most of ones entire career with a single employer are over for most of us. Operating as a job-market free agent, as many individuals now do, requires strong networking skills. Second, professionals today possess a keen desire to make a difference through their work. This form of altruism makes networking a way of life as individuals continually look to add meaning to their lives not only through their work, but also in the ways they spend their non-working hours. Third, layoffs have become one of the harsh realities of American business over the last few decades. Even for those who are currently employed, layoffs are often a looming reality. Whether at work or out of work, we need to network. Networking, Like Life, is a process not an event. A learned skill, true networking represents the summit of marketing know-how, whether one is marketing products or services, or even oneself as a prospective employee or business partner. By learning and utilizing key principles, individuals can systematically manage network contacts from the point of simple awareness, through a series of measurable milestones, to the achievement of an identified goal. These networking principles are adaptable to virtually any set of circumstances, making them beneficial to the pursuit of almost any professional goal. Step 2 Generating Interest - The Carnegie Way"
"'Tales From The Networking Community' is a book that reflects Dan's vision for networking in the 21st century. His brilliant writing style paints a picture we all aspire to achieve; one world connected, one global family." "Williams explains the science of networking using metaphors anyone could relate to. The Five Steps to Networking Success charges networkers to create objectives and goals when meeting new people, instead of just collecting business cards." 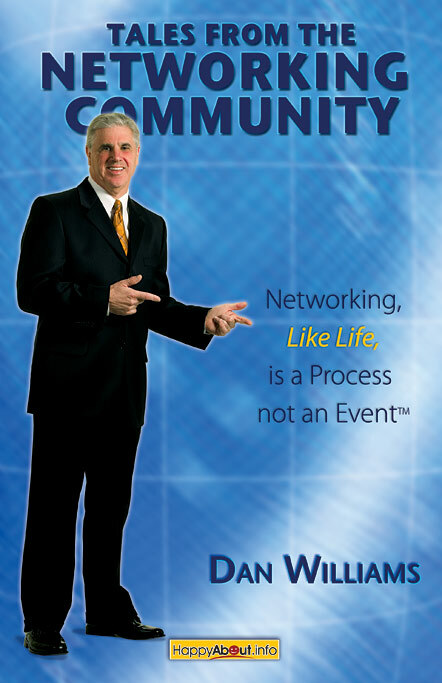 "After reading 'Tales from The Networking Community' you also will appreciate why Dan Williams is the highest endorsed individual on Linkedin.com in North America amongst more than 5 million people!" "Networking is a combination of art and science, and NOBODY understands this better than Dan Williams. He headed up the monthly networking segment on my radio show, providing my audience with ideas to grow their businesses and I used them in MY business too. They worked!" 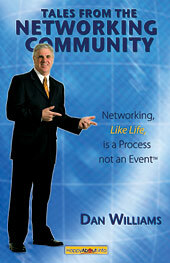 "Dan Williams has written the book on networking literally! While many of us network, because it is a component of our marketing strategy, Dan had a deeper and more compelling reason. Networking can be the most time-wasting and frustrating business activity, or can propel your business to incredible heights. In this book, Dan shows you how to master the process of networking and leverage its power A must read!" "Among the many qualities that makes Dan Williams the master networker is his genuine desire to help others combined with his relentless consistency. In Tales from The Networking Community, Dan explains through inspirational stories and practical advice why those qualities are essential for successful networking." "Too many "networkers" confuse networking with computer platforms or with networking events. I'm happy to tell you that Dan Williams gets it right when he says networking is about life. If you want to learn how to continually improve your life through networking the right way, read the book on networking!" Dan Williams presently leads the small business sales team for XO Communications. Previous to XO Communications, Dan founded The Networking Community - a resource center and membership organization helping individuals and organizations maximize the value of their business networks and networking. Williams’s success as a sales executive grew dramatically until the bust of early 2000. When the tech bubble burst, like many, he went to being unemployed and without a viable network overnight. Dan credits his successful return to the telecom industry to networking – and has a passion for helping others through his personal experience. As one the highest endorsed individuals on LinkedIn, Dan is known worldwide for his guiding principle - Networking, Like Life, is a Process not an Event.